Tirana (Albanian: Tiranë or Tirana) is the capital and largest city of Albania. Its population is estimated officially at 353,400 in 2003, though other estimates put the figure as high as 700,000. Founded in 1614, it became Albania's capital city in 1920. It is located at 41.33°N, 19.82°E in the district and county with the same name. Average altitude is 90 meters above sea level. The temperature varies between 6.7°C (44.0 °F) in January and 23.8°C (74.5 °F) in July. Annual rainfall is 1200 mm (47 inches); the driest months are July and August. Located on the Ishm River, Tirana is Albania's chief industrial and cultural centre. The principal industries include agricultural products and machinery, textiles, pharmaceuticals and metal products. Tirana has experienced rapid growth and established many new industries since the 1920s. Tirana is presently trying to develop a tourist industry, although this effort is hampered by the political instability in the region, owing to military conflicts during the 1990s in Albania and neighboring Bosnia-Herzegovina, Kosovo and the Republic of Macedonia. The Et'hem Bey Mosque, which was begun in 1789 by Molla Bey and finished in 1821 by his son, Haxhi Et'hem Bey, great-grandson of Sulejman Pasha is a significant landmark. Another landmark located near the Ethem Bey mosque in Skanderbeg Square is the clock tower (Kulla e Sahatit) which was built in 1830. In 2001, the construction was finished on the biggest church of Tirana, Catholic Church of Saint Paul. Tirana also features the University of Tirana, founded in 1957, and many governmental and social buildings such as the Albanian Institute of Sciences, the Academy of Arts, the Agricultural University, the Military Academy, the Institute of the Ministry of Internal Affairs, the People's Assembly, and the High Court. Tirana was founded in 1614 by the Ottoman general Sulejman Pasha, who built a mosque, a bakery and a Turkish sauna, and named it "Tehran", as a tribute to his military victory at Tehran in Persia (now Iran). Although this is controversial as there was prior mentions of a castle in Mount Dajti called Tirkan by a sixth century Byzantine Historian. 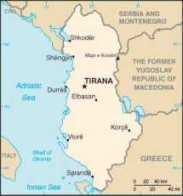 Tirkan is said to have been there since the first century BC. Another mention of the area was found in Venetian records, which showed the area under the same name as the city today. The mention is dated around 1412. The small town was selected as the temporary capital of Albania (as a compromise between South and North Albania) by the provisional government established at the Congress of Lushnjë (January 1920). In November 1944 the communist government of Enver Hoxha was established there after the liberation of the city from German occupation on November 17, 1944. The city's population, estimated at only 12,000 in 1910, rose to 30,000 at the 1930 census and 60,000 in 1945 despite the intervening years of foreign occupation and war. During the 1950s Tirana experienced a period of rapid industrial growth, raising the population to 137,000 in 1960. In the late 1990s Tirana experienced its fastest population upsurge as Albanians from the north moved to the capital in hopes of a better life. Currently, the city suffers from the problems of overpopulation such as waste management, lack of running water and electricity as well as extremely high levels of pollution from the 300 000 cars moving in the city. The problem is exacerbated by an aging infrastructure. Despite the problems, Tirana has also experienced a very rapid growth in the construction of new buildings, especially in the suburbs of Tirana, where many of the new neighbourhoods do not have yet street names. During the recent years pollution has also become a very big problem for Tirana. It is worth mentioning that there is a unique trait to the city, that effectively moderates the impact of air pollution: The Saint Prokopi park- a very vast forested park in the outskirts of the city, that absorbs and purifies much of the polluted air. During the late 1980s and early 1990s Tirana was the focal point of violent demonstrations which ultimately led to the collapse of the communist government. Unfortunately I do not have many of my photos left, although we had four cameras between us and we taken many, many photos wherever we went, two of my cameras, with large, 512 MB SD Cards and many thousands of photos on them with my valet and money, were stolen from my bag, later into our trip, by some 'lowlife'.